I think I've gone completely mad just thinking about farming that many apexis crystals. 150.000 crystals... how much you say ! If you get the 1.000 crystal quest everyday it takes 150 days. Hmmm I smell a way to do collecting that faster. Better start gathering apexis crystals now, although I doubt it will actually be 150k unless they make a new easier way to farm them. Time to start collecting Apexis Crystal. Now. Покупается за 150,000 апекситовых кристаллов. I just spent my 50k or so getting a piece of gear to 675. Gee, thanks. Good thing Mage tower will bring some back. 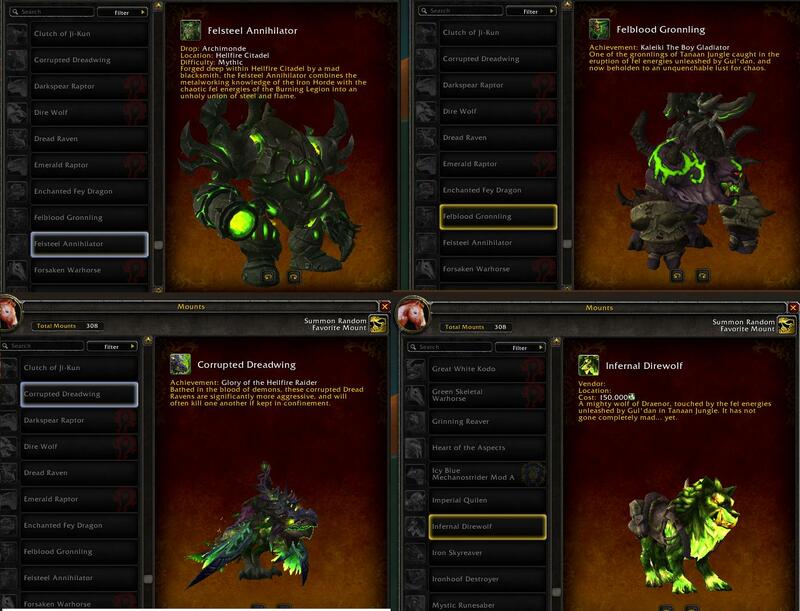 I'm hoping they fix this to look more like the green fel corrupted wolves that sit outside the alliance garrison to the west. As is, it does look unfinished so there is definitely hope! Yet another Apexis grind, Jeezus f'n christ how the hell do we muster up 150k of Apexis? 150k apexis crystals for a wod-wolf reskin that i have allready 3 of... Could it like atleast breath fire or something to make it worth ~130days of grinding? Too bad you can't pool together Apexis Crystals from all your characters. Mounts are indeed account wide. So imo should be a thing. It would make this a bit more tolerable. I'm assuming Blizzard will have to increase the apexis crystal cap, seeing how this mount costs 150k and the current cap is only 60k. Ugh, ANOTHER wolf? Really? Blizz's way of being lazy with all these reskins amazes me. Glad to have something i find worthwhile to aim for with my crystals. If you haven't already collected the mounts for Frostwolf Clan and Laughing Skull (or the factions for Alliance), buy a missive with garrison resources for the areas that give rep. These missive quests are repeatable, so you can load up on a bunch of them. While you're grinding your rep, you can earn crystals at the same time. You'll earn 800 crystals for every missive completed. You can double up on two things at once. Not to mention that you'll loot a few crystals while killing these mobs, too. As you all already realised this Item has a Sell Price of 25`000 Gold. If not changed until the Patch release. This will be the most efficient way of turning Apexis Crystals into gold. the proportion of the cost of this mount to the gold it sells to the vendor is 1/6, meaning, for every 6 crystals you can turn effectively into 1 Gold. So with every day-lie Apexis Quest that grants you 800 Crystals you gained 133.3 Gold. For every 1000 Crystals Daylie you get 166.6 Gold. Think about it the next time you skip a daylie Apexis quest. make them buy gold tokens instead of adding another store mount and force them to do the stupid apexes quests... ALL by just including a "new" mount! well played blizzard.. well played. @WatcherDev Confirmed this is not the final price, so everyone stop flipping out. Can't go wrong with a glowing wolf mount. Also that beast should be tameable by hunters, but that's another topic altogether. Just a recolor of other WoD wolf mounts. Not new, not worth buying, since I have at least two others that look just like it. Well I sure hope this wolf can melt critters with demon eye beams, fart clouds of raw fel energy, sprout fel wings and has a tiny little transmog vendor dude riding on its back to make up for its price. Garrison missions should award "a lot more" apexis now. Otherwise this will be a pain. Looks like it's going to worth taking that pain though. "In general, numbers in particular on PTR are often not final. Costs especially." Previously on the PTR this mount was purchasable for 150,000 Apexis Crystals, and Reins of the Corrupted Dreadwing was the achievement reward. The two mounts have now switched places. Do you think the 25k sell price is to compensate for the disappointment felt when you learn this is another recolor? I created some Video Guides for this achivements. HFC ACM-Guide: Get In My Belly! "A mighty wolf of Draenor, touched by the fel energies unleashed by Gul'dan in Tanaan Jungle. It has not gone completely mad... yet."